One of my favourite flowers in springtime wedding bouquets is the sweetly scented Lily of the Valley. I love they way they peek out so elegantly from their luscious green leaves and those delicate bell shaped flowers get me every time. I can still remember when the Duchess of Cambridge carried a bouquet of these sweet blossoms at the royal wedding. Its simple beauty couldn’t have been more perfect for such a grand affair. I was recently inspired to create some Lily of the Valley hair combs – something that beautifully captured the simplicity of tucking a few stems into a softly tousled updo. Fresh Lily of the Valley stems certainly impress with their delicate fragrance but these handcrafted creations will last beyond the wedding day and will become beloved family heirlooms. You can position the bridal hair combs side by side or separate them and tuck them into your romantic ‘do. 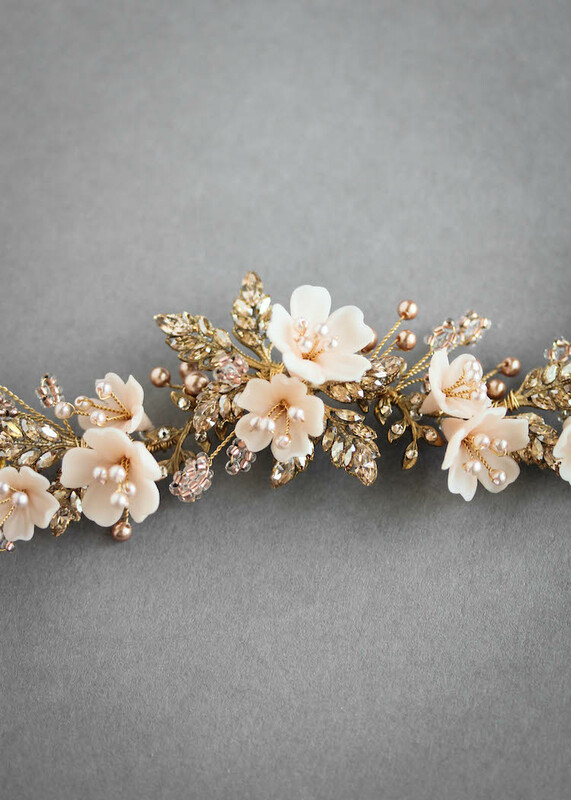 Either way, these gold and ivory toned hair combs will add a timeless and whimsical touch to your bridal look! If you love these pieces, feel free to get in touch. I’d love to create a set just for you.